Pope Saint Gregory III was the Pope from February 11, 731 to November 28, 741. His pontificate like that of his predecessor was troubled by the iconoclastic controversy (the deliberate destruction of religious icons and other symbols) in the Byzantine Empire. He was the son of a Syrian named John, and was elected Pope by popular acclamation. He did not receive the approval of the Byzantine exarch in Ravenna, the last pope to seek the exarch’s ratification of a papal election. Upon his accession as Pope, Gregory immediately appealed to the Byzantine Emperor Leo III to moderate his position on the Iconoclastic controversy. When Pope Gregory’s representative was arrested on the orders of the emperor, Gregory called a Synod in November 731, which condemned Iconoclasm outright. Leo responded by trying to bring the Pope under control, although the fleet he sent to enforce the imperial will, was shipwrecked in the Adriatic Sea. Failing, he appropriated papal territories in Sicily and Calabria, transferring ecclesiastical jurisdictions in the former Praetorian Prefect, to the Patriarch of Constantinople. His attempt to force the Duke of Naples to enforce an imperial decree to confiscate papal territory in the duchy failed, as the Duke was supportive of the Pope’s stand. Pope Gregory demonstrated his opposition to Iconoclasm by emphasizing his veneration of icons and relics. He repaired numerous beautiful Churches, adorning them with icons and images of Jesus Christ, the Virgin Mary and many Saints. He ordered in the heart of St. Peter’s Basilica and Iconostasis, situated between six onyx and marble columns. He also built a new oratory in St. Peter’s Basilica, which housed relics of several saints. He was also an enthusiastic supporter of monasticism; he established the monastery of St. Chrysogonus and rebuilt the hospice of Saints Sergius and Bacchus near St. Peter’s. Pope St. Gregory also promoted the Church in northern Europe. He supported the continuing mission of St. Boniface in Germany, elevating him to the rank of Archbishop of Germany in 732. In 732, Gregory banned the consumption of horsemeat, both domestic and wild, comparing it as an “abomination” since it was associated with pagan ritual feastings. He was very conscious of the ongoing Lombard threat, and undertook and completed the restoration of the Walls of Rome. Pope Gregory III died on November 28, 741, and was unsuccessful at stopping the Lombard advance of his time. He was succeeded by Pope Zachary, and was buried in St. Peter’s Basilica, in the oratory he had built at the start of his pontificate. 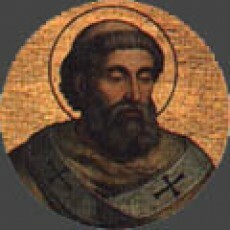 Pope St. Gregory III was a Pope in the early Church, and faced many problems that the early church faced. He was confronted with the Iconoclastic controversy, the deliberate destruction of religious icons and other symbols, and stood up against it. He wanted the Church to be decorated with Icons and Statues of Jesus Christ, the Virgin Mary, and the great Saints, and did so. He brought that practice into the forefront, as he built and remodeled many churches. He taught that it was not the worship of these icons the Church was promoting, rather a means to draw us into a deeper spirituality.